It's been some five years since I last watched Aria. In that large expanse of time, I've had several moments where I wondered if there was something missing in my experience of the series, as while I always thought Aria to be pleasant and enjoyable, it never quite had the same magic that so many others seemingly felt. And indeed, with the beautiful Euforia playing once more in Avvenire's second episode, I was truly, honestly, starting to become convinced that I was wrong. But as the third episode drew to its close, and I noticed I had not felt much of anything since Euforia left my ears, the one, penetrating thought that came to mind was "Oh. So this was why." Aria has been described by many as an "iyashikei" -- healing -- series. There's no doubt that is the case. Aria's beautiful setting (modelled after Venice - arguably the prettiest city on Earth), its relaxing music, dreamlike moments and happy-go-lucky characters are sure to make anyone's day just a little bit brighter. There are scarce few anime with an atmosphere like Aria's and such an ability to relax and make people feel warmer inside. Aria aims to do only one thing, and it does so masterfully. It would be a considerable challenge to dispute such. But I've realised something through watching Avvenire. I know now why Aria never hit those strong emotional beats for me. Its bright, rainbow-coloured torrent of happiness doesn't feel tangible. It feels, like the series itself, a fantasy, out-of-reach, never to be grasped. Some anime portray life as being far more miserable than it truly is. And Aria portrays life as being more joyful than it is. It is the balance between these two extremes-- the good and the bad, often crossing and intertwining-- that give emotional weight to a moment in time. Life is beautiful precisely because it is flawed and difficult. If every moment is happy, then happiness ceases to exist. I don't want to be held and told everything will be OK. That doesn't accomplish or fix anything. I want to be beaten down and grow stronger for it. I want to face my problems head-on and surmount them. That is what life is about, and that is how people attain their happiness. Life is a rollercoaster that consistently winds upwards, downwards and sidewards; it is not a gondola leisurely floating across the sea. While Aria's worldview may be naive, that is not to imply I think the rest of the series is bad for it. It is quite the opposite. Aria, as it is, is a well-crafted, at times excellent slice-of-life series, exemplary within and outside its genre. It found its footing in the The Natural, peaked in The Origination, and has ended things gracefully in The Avvenire. Even with seven years spanning between the production of the previous season and Avvenire, the feel and the quality remains the same (though the art can occasionally dip to levels decidedly below average), and any fan of Aria is bound to have a lovely time with it throughout its regrettably short three-episode run. More is just the one thing it needed, if largely because I wanted to learn more about the new girls. So little is said about them that they feel more idea than character. Avvenire is in effect an epilogue - a farewell rather than a new beginning, which can be a bit unexpected due to the addition of these characters. Who are they? What will their story look like from here on? It is only in the latter half of the third episode does one realise that there was no tease, and that it was already over. Aria the Avvenire is a sweet, yet brief return to a series well-regarded. It expands upon Akari's and Alicia's relationship in a meaningful way, and consequently exists as more than mere fanservice. It may be optimistic to the point of nausea, but then I suppose one can only fault Aria so much for being Aria. I think it's safe to say that Aria the Avvenire was truly a miracle of an anime. First, some history. It's hard to appreciate this incredible ending to the Aria series without a bit of backstory. Aria began as a manga series in 2002 and enjoyed a very successful six-year run following the story of Mizunashi Akari and her dream of becoming a Prima Undine. It was adapted into a three-part anime series: Aria the Animation in 2005, Aria the Natural in 2006, and Aria the Origination in 2008, with both the anime and the manga ending at around the same time. And for seven long years, everyone thought that their magical journey through the waterways of Neo Venezia had finally come to an end. That's when the miracle happened. Collaborating with the original author Kozue Amano, the entire staff of the Aria series decided to return for a special 10th anniversary story. A new studio, TYO Animations, was able to gather up the original producer, screenwriter, and all the voice actors once again - with the exception of Kawakami Tomoko, who passed away in 2011 (she still reprises her role in the OAV series in her honor). Kozue Amano even did the character designs for the new characters and wrote a special one-shot manga alongside Avvenire. Once again, the waters of Aqua were stirring. Simply put, Avvenire rewards fans of the Aria series with the best combination of gifts: closure on unresolved storylines and a preview of the future of the girls we've come to admire as our tour guides of this series. The flashbacks were actually well-done, with glimpses of things during the series that were never fully explained or developed. I was thoroughly impressed they decided to go back and explain why Cait Sith, who played such a big role in Natural, was not even mentioned once in Origination. A common theme that Avvenire makes clear is that past and present are connected, and the flashbacks do a good job of relating the two together. Aria the Avvenire picks up chronologically after the time skip at the end of Origination, with Aino Ai joining Akari at the Aria Company. Seeing Ai come from being Akari's first unofficial customer to her pupil, with them exchanging letters the whole series through is unbelievably satisfying. She meets Aika and Alice's new pupils (their names also start with A because combo) and they become close friends. I think the generational thing is cute, though by the third generation it's hard to have anything new: Anya and Azusa seem too similar to Aika and Alice and there was obviously no time to develop any sort of character whatsoever. Also, huge demerits for poorly written dialogue and spamming of the English word "miracle"; at least substitute "kiseki" in there occasionally. The art direction in Avvenire is outstanding. There are so many golden moments, especially in the flashbacks. Cait Sith and Akari falling from the sky. Akari and Alicia enjoying the Neo Venezian evening with the night-light bell. They took the time to update decade-old art with modern standards while paying homage to the original style. All in all fantastic. I only wish they had more budget so they could redraw the flashback scenes from Origination in the third OVA. Each OVA begins with a different OP from the original anime run: Undine, Euphoria, and Spirale, all by Makino Yui. Good choice, brings the nostalgia back and also themes each episode to correspond to a different season of the original anime. Aria had a great ending with Origination and the original ending of the manga. But the effort that the author and the returning staff took to create something that both honored and continued that legacy can be clearly seen. I think Avvenire is an important piece to the landscape of Aqua that has been carefully pieced together for over a decade now. And with this, who knows what will come in the future? That's the miracle of hope that Avvenire leaves behind. About 10 years ago from the time of this review, the world was given the gift that was Aria, a series about the little miracles in life and to appreciate the gift of others. With Origination finishing up the main series back in 2008, we never expected there to be any more and that the story would just be washed away with that gentle little end. But here we are years later with the true and final installment of the Aria series, Aria the Avvenire. 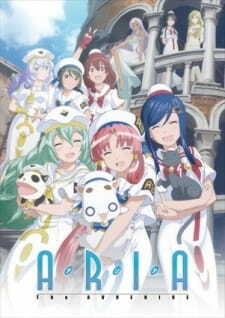 Story: Taking place a few years after the end of Origination, we return back to the world of Aqua and Neo-Venezia, where the three water fairies: Akari, Aika, and Alice have taken the reigns over their predecessors and have forged a new era of Undines with their new trainees, Ai, Azusa, and Anya respectively. It is here where we return back to the gentle and miraculous lives of the Undines and the beautiful world that they live in. First off, I am personally a bit disappointed at the story aspect of this series. The reason for this is because Avvenire first comes off as an 'afterstory' series, where we return back to the world a few years after the events of the three seasons of the Aria story. Instead however, we get a 3 part OVA that instead of just being an afterstory, reflects back on the past events and ties up a few loose ends with its main cast of characters, most notably the Undines from the Aria Company, Akari and Alicia. As a result of this, the OVAs show us events of the past according to this point in time rather than those of the present, and as such, really kill the afterstory setup. On the flipside, the parts of the supposed 'afterstory' were decently good. They showed us the new generation of Undines and their little discoveries that were reflected from the original series and most importantly, shares that same feel of gentleness, enjoyment, and fun that the Aria series is known for. A pity that we don't actually get more, because the shenanigans that the trio of Ai, Azusa, and Anya would've probably been a set of interactions that I would really like to enjoy. All in all though, Avvenire is a good end to the Aria series. Functionally, it ties up a good number of the loose ends that the original series had never really touched up on, and gave us a glimpse of the new generation that's always nice to see with this kind of show that features generations. The overall feel of the OVA is most definitely in line with the calm and gentle atmosphere that Aria had, and for that, I commend it. Characters: Characters for these OVAs is something that has its fair share of goods and bads. Given the way that the OVAs are written, there's an imbalance of focus which creates the difference in the amount of development characters get. The OVAs has its focus around Akari and Alicia for the greater majority of the 3 episode runtime. Tying up loose ends and backstories with the time devoted to them, we get a bit of a deeper look into the kinds of things that they've been introduced to, what they're said goodbye to, and also what they are now, which when presented, really makes a pretty nice bit of content to watch. As sad as it is, the remainder of the original cast doesn't get that luxury. Aika, Alice, Athena, and Akira all are shafted to the side and don't get much time if at all devoted to them, which is honestly quite a shame given how quirky and key they all were to the series, even if the point of view was never REALLY on them. On the flipside however, there's the new generation of Undines: Ai, Azusa, and Anya. Now this is my biggest complaint with the OVAs. These three, get nothing to them. The scenes that we're shown with them aren't particularly special despite having the general Aria feel. They just don't feel important at all and we barely get any time to know and learn about who they are as people. We know that they want to find the little miracles in life and follow the footsteps of the three main girls of the Aria series, but because the show devotes so little time to them, I feel like it's a bit of a crime to not have OVAs show the new generation and the kind of situations that they get into. Art: Made by TYO animations, a studio made from combining the studio who originally made the Aria series, Hal Film Maker, with Yumeta, Avvenire is a beautiful piece of art that can only be described as a series that has aged well. The OVAs looks like Aria the Animation in terms of the artstyle, but with a much more cleaner and high quality look and feel that's more than breathtaking to look at. (Not bad for a gap of 10 years) In essence, the art is still the same, but painted over with a new coat that gives this beautiful series the quality that it deserves. Sound: The OST is virtually the same as what we're presented with in Origination. Actually, I'm positive that it's the same. From the OP to the ED, to the gentle and plucky background music, there really is nothing to complain from the sound. Personal Enjoyment: Aria is by far one of my favorite series to ever exist in anime. Its story and atmosphere is simple and gentle, yet it gives off a sense of appreciation to the things around us. From the time we spend with loved ones, to the little miracles we see everyday, Aria's gentle waters teaches something that most anime don't ever really focus on. Despite the OVAs' problems in terms of storytelling and characterization, I loved these three OVAs and was happy with what we got. I really just wanted to spend more time with these characters more than anything and I really liked every second of it. And to see the series's final end, I have to say, it is a tearful, yet beautiful goodbye. Well, it has atmosphere. There's lots of sweeping shots of the scenery, and the sound design really fits the location well. Aria is known for its beautiful artwork, and it certainly delivers when it comes to that. There are tons of shots of towns and oceans and bridges, all lovingly rendered to the sound of strumming string instruments and angelic voices. However, when it comes to the characters themselves, the art is not nearly as good. They really stick out compared to the beautiful scenery, all very plain compared to the backdrops behind them. Even tables look detailed in comparison. As for how the characters act...they're all rather muted, rarely showing any emotion other than "cute" and "quiet" which...aren't even emotions. So in short, they're pretty emotionless other than the occasional art-shifted outburst. Usually slice of life shows these days are driven by their characters, so maybe its unfair to judge a slice of life anime based on older source material. I feel like they just shoehorned in every character from the original series, which ends up giving most characters glorified cameos. Still, Akari, with the most screentime by far, is fairly bland throughout. Story? Its a slice of life anime, it doesn't really have a story. The setting is rather interesting, with the show taking place in Mars-turned-Venice. Yet...its set 300 years in the future and using technology already considered outdated. So its more of an excuse setting for a massive city of Venice. Anyways, while there is a loose plot and episodic structure you'd expect from a slice of life anime, even that is stretched thin, and there's tons of scenery shots and music to fill in the gaps.